The GlowStreak's ultra-bright colour-changing LED core is bounce activated, waterproof, slobber-proof, and includes replaceable batteries. 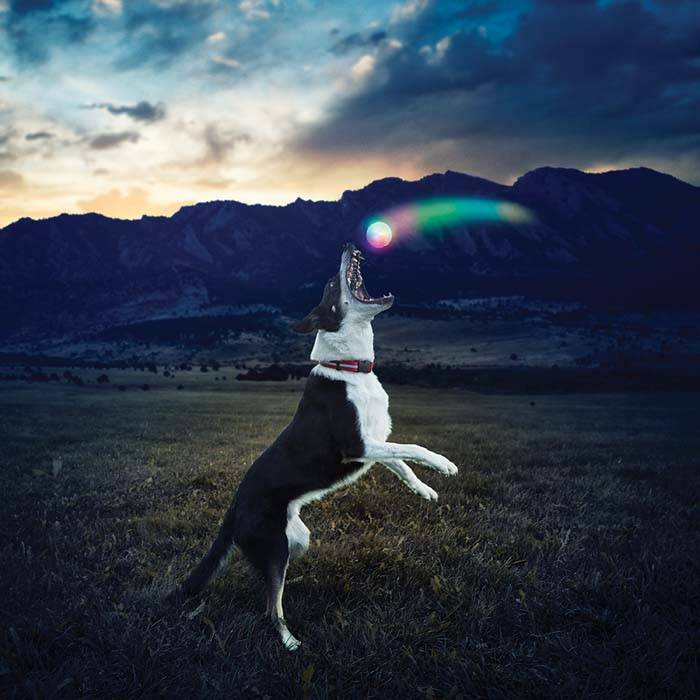 It's ideal for the ball-obsessed dog who wants to play fetch all day--and night. 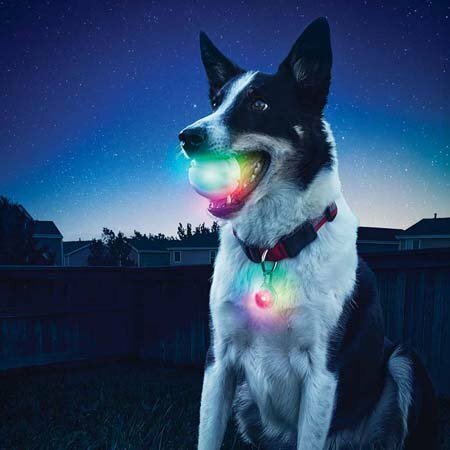 The GlowStreak LED Ball is the most technologically advanced nighttime fetch ball ever made, and holds up to the best arm or ball launchers around. This robust rubber ball has a protected inner core that contains an advanced motion-activated LED module with bright red or colour-changing Disc-O LEDs, and it turns on with a simple bounce. It also features an auto shut-off function after ten minutes without a bounce (5 minutes of glow followed by 5 minutes of flashing), giving you or your dog time to find it if one of you becomes distracted. The molded, shockproof, removable polycarbonate core houses the LED/battery module and screws securely into place creating a waterproof seal. The same size as a tennis ball and invincible to water or slobber, this tough little ball floats, and is great for the dog who loves to swim. The unique grooved design on the surface creates a bite friendly exterior that is easy to pick up for small and large dogs alike, making it the perfect fetch toy for your four legged friends of all sizes. Powered by replaceable, long-lasting batteries, you can have up to 35 hours of playtime with the GlowStreak. The GlowStreak is also available in a combo pack with a one-of-a-kind GlowStreak-matching SpotLit LED Collar light so you can keep track of your dog day and night. The SpotLit is a classic Nite Ize product - it's a water resistant, durable LED that clips easily to your dog's collar with its integrated stainless steel carabiner clip. This Disc-O SpotLit can be set to a colour-changing glow or red-flashing mode with a simple push of a button. With this custom designed LED module that is powered by replaceable long lasting batteries, you are sure to find the SpotLit to be an excellent addition to your Glowstreak light show of nighttime fetch.